The CAN - IO device has been developed to operate as an intelligent input module which is able to read a variety of digital and analog inputs and broadcast them on the CANBUS network. 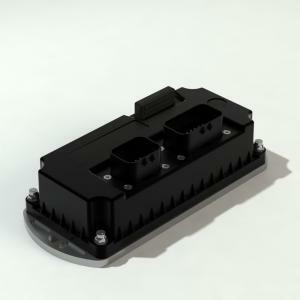 This allows expansion of the I/O capabilities of any of our CANBUS capable motor controllers and provides for a simplification of the wiring harness, as only 4 wires are required to connect to other nodes of the CAN network. In addition, the double-microcontroller architecture (master-slave hierarchy) improves the safety level of many functions by providing an additional check for both analog and digital inputs.